An extract from the book, Internment, by John McGuffin, on the thinking that went into the policy of internment without trial, implemented in the north of Ireland 39 years ago this week. In the mid-1960’s people might have been forgiven for thinking that internment was a thing of the past. (True, the obnoxious Special Powers Acts were still on the Statute Book, but they were in abeyance). Such thinking was not to be right, however. The monolithic structure of Unionism proved incapable of reforming itself under the onslaught of the civil rights campaign. Terence O’Neill might have been able to save the Unionists with his pragmatic approach and his appreciation of the need for change, but their diehard ‘not an inch’ backwoodsmen would have none of it. And so the week of 12 - 16 August 1969 saw the old familiar pattern: a police force unable, and, in many cases unwilling, to prevent the sectarian attack upon the Falls Road periphery, led in some cases by the B-specials. That month was to see house burning, intimidation and murder - ten civilians dead, including a 9-year-old boy asleep in his bed, shot by a high-velocity Browning machine-gun used with murderous recklessness by the police in their Shorland armoured cars; 145 injured, hundreds of families burnt out of their homes, 90% of them Catholic. Free Derry was born that week. The barricades went up in Belfast. The first steps towards the irrevocable demise of Stormont were taken. And, predictably, men were detained, without charge or trial. At 6.45 a.m. on 14 August, 28 Republicans were arrested and taken from their homes. As usual, no ‘Loyalist’ extremists or gunmen were arrested. But this time it was not to be internment. The British army had had to be called in. Callaghan and Wilson had summoned Chichester Clark to Downing Street. The B men were ‘phased out’. The Scarman Tribunal was set up. The Labour Government was tired of the old-fashioned traditional Unionist methods. Moreover, from behind the barricades a campaign was being mounted. Illegal radios proliferated. Street newspapers were born. The detainees were released after 17 to 20 days. 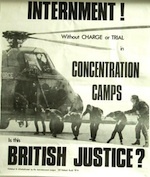 The message should have been clear; internment should have no place in the 1970’s. But the Unionist hierarchy learn nothing from history. The gangling figure of Chichester Clark, the stand-in PM, shambled off into obscurity as 1970 and 1971 saw an escalation of the violence by the Provisional IRA, themselves a reaction to the attempted ‘Loyalist’ pogrom of 1969. On 23 March 1971 Brian Arthur Deane Faulkner achieved his lifelong ambition and became PM. The English press warned that he was the ‘last man in’. If he couldn’t control the situation, direct rule was a certainty. But despite the obvious immensity of the task, Faulkner was confident. In fact, Faulkner’s intelligence was always greatly over-rated by the media. And his biggest mistake was soon to come. The Sunday Times ‘Insight’ team claim that “when he took over the issue was not whether internment was to come, but when and on what scale. By then Faulkner had been an advocate of internment inside Chichester Clark’s Joint Security Committee, for six months.” Whether this is true or not, and on balance it seems a reasonable statement, it is certain that Faulkner had completely failed to learn the lesson of how and when internment ‘worked’. He had been Minister for Home Affairs in 1959 under Brookeborough, and, with the help of his trusty aide, the civil servant William Stout, he bad been responsible for the implementation of internment, which he apparently felt to be responsible for the defeat of the IRA border campaign. As is made clear already, this just was not so. The campaign failed, for lack of popular support, and, most important, the internees could languish in Crumlin because there was no campaign to get them released. Nevertheless, one of Faulkner’s first actions upon becoming Northern Ireland’s last PM was to order the RUC Special Branch to work with the Director of Military Intelligence at Lisburn in drawing up a list of those Catholics who should be interned. The army were unhappy. General Tuzo, the GOC in Northern Ireland since February 1971, consistently opposed internment, believing, rightly, as it turned out, that they could not get the right people. But as the violence escalated, Faulkner became more and more insistent. On 9 July he telephoned Heath. “I must be able to intern now” he demanded. Accordingly, with some reluctance, a ‘dry run’ was agreed upon. At dawn on 23 July, 1,800 troops and RUC raided Republican houses throughout the province, searching for documents. They got enough to encourage them. The decision to intern was only a matter of time then, despite army objections. The position was complicated by the mistrust and, in some cases, downright hostility between the army and the RUC. As the Sunday Times team put it: “The army believed the police list was politically motivated, and the police believed that the army’s list showed inadequate local knowledge.” Both were correct. Some sections of the army had favoured a small internment in the spring of 1971, with only 50 or 60 men being lifted. They had been overruled. Now the task was to be much greater. The list had more than 500 names on it. Of these only 120 or 130 were gunmen or officers in the IRA. The vast majority were regarded either as ‘Fellow-travelling sympathisers’ or troublesome political activists - like PD socialists. The police contribution was the names and addresses of former internees. But Faulkner was determined. At the Joint Security Committee meeting at Stormont, Shillington, the Chief Constable, agreed with Tuzo that internment would not work. That made no difference. Faulkner secretly flew to London that afternoon. There he convinced the Cabinet. Tuzo could offer no alternative. Maudling was his usual indolent self. Whitelaw said nothing. Internment without trial was acquiesced to. The date was set for 10 August. On Sunday 7 August, however, Harry Thornton, an innocent building worker, was driving his car past Springfield Road barracks when it backfired. Soldiers opened up and killed him. His friend Murphy was dragged from the car, covered with Thornton’s blood, and savagely beaten by police and army. Within minutes the people of Clonard went wild. The fighting went on all night but had died down the next day. But the army were taking no chances. At midnight on Sunday the order went out: operation internment was brought forward 24 hours. Brian Faulkner had unwittingly signed himself his own political death warrant - and that of Stormont, too.